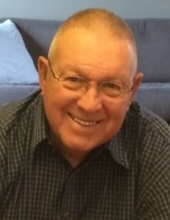 Joe M. Frische, age 80 of Seymour, passed away on Tuesday, January 29, 2019 at Columbus Regional Hospital. Born January 7, 1939 in Seymour, he was the son of Lawrence and Martha (Noblitt) Frische. On May 11, 1979 in Seymour, Joe married Patricia “Pat” Harvey-Haycraft. Joe served in the U.S. Army at Fort Leonard Wood in the 4th Battalion 3rd Regiment. He attended Peter’s Switch Church of the Nazarene. Joe lived to go fishing. He also enjoyed I.U. Basketball and watching his grandkids ballgames. Survivors include his children, Mike (Barb) Frische of Hayden, Brad (Carol) Frische of Seymour, Lynn (Bob) Pierson of Bloomington, Karyn (Brad) Rumph of Vallonia; grandchildren, Lauren Frische, Kaitlyn (Kevin) Ude, Evan Frische, Cody (Kristen) Frische, Morgan Frische, Collin Bratcher, Bo (Traci) Pierson, Ty Pierson, Lindsey (Dustin) Sanders, Brandon Rumph, Shelby Rumph, Staci Rollins and Eric Wilson; great-grandchildren, MaKinlee, Klayton, Sawyer, Rylee, Aubrey, Brynlee and Charlotte; sister, Margie Eble. Joe was preceded in death by his parents, wife and brother, Fred Frische; and granddaughter Alexis Frische. To send flowers or a remembrance gift to the family of Joe M. Frische, please visit our Tribute Store. "Email Address" would like to share the life celebration of Joe M. Frische. Click on the "link" to go to share a favorite memory or leave a condolence message for the family.